11th December 2017 - Schuster Completes! Manchester University’s new Schuster Annex was awarded to Dortech by Main Contractors Willmott Dixon NW and designed by architects Hawkins Brown, Manchester. 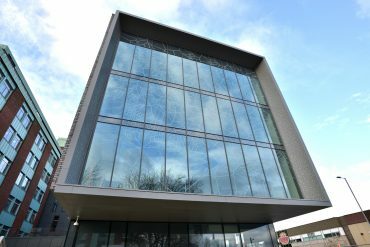 This fantastic scheme incorporates over 1,000m2 of architectural glazing system designed, manufactured & installed by Dortech. Saint Gobain SGG COOL-LITE® SKN 174 Glass with Digitally printed artwork! Previous Post Shrewsbury Street Completes!